A few months after my father was killed, my mother purged a ton of his books, so when I was at her house searching for something to read, it shouldn’t have been a surprise that the bookshelves were as bare as a Venezuelan supermarket. All I found were a few religious books, some non-fiction war books and…All Quiet on the Western Front. I probably grimaced when I pulled it off the shelf. Not only because it was a boring war novel that you’re assigned in high school, but also because on the cover was John Boy from The Waltons TV show. That show bored me to death, as did the character, so I can’t dissociate the actor from the character, or the show. Nevertheless, I took it with me. It was short enough to meet my classic challenge standard, and I love the history of Germany during the pre-WWII era. So I figured I’d just try to not look too long at John Boy on the cover and give it a try. I was expecting Erich Maria Remarque’s classic to be boring. It wasn’t. I was also expecting it to be staid and mannered. I was wrong again. All Quiet on the Western Front is the story of Paul, a battle-hardened German soldier fighting along the western front in France during World War One. In his preface, Remarque clearly states that the book is not meant to be anti war. While it could easily be mistaken for a pacifist plea, it’s not. It’s just a detailed account of life as a soldier. At times the writing is bawdy. He’s not adverse to throwing in a few fart jokes, of all things. In other episodes, Remarque, through the narrator, clearly relays the intense camaraderie that develops among soldiers. This falls just short of romanticization, which makes it even more effective. One thing that kept coming back to me (which was in contrast to the thirtysomething actor on the book’s cover) was Paul’s age. He and his friends enlist just after high school. He’s 19 during the course of the book. More than once he comments on how disillusioned he and his entire generation have become because of the war, how lost they are, how much they’ve aged. This was one of the most powerful themes for me. All Quiet on the Western Front is bursting with rich description. Unlike most modern novels, it’s not told in a traditional three-act structure. That’s because it was serialized during the 1920s. I found the episodic nature of the chapters compelling. All Quiet on the Western Front didn’t go over too well once the Nazis came into power. It was a target of book burnings, and Remarque fled the country. The Nazis are long gone, but his book still persists. Next up, my first failure. Ian Tregillis’s alt history/sci-fi mashup scores big on imagination, even if many of his characters are flat. Aside from the supernatural/horror/sci-fi, another thing I’m a fan of in pop culture is alternative histories. The “what if” has always fascinated me, mainly because it lets the imagination run away. 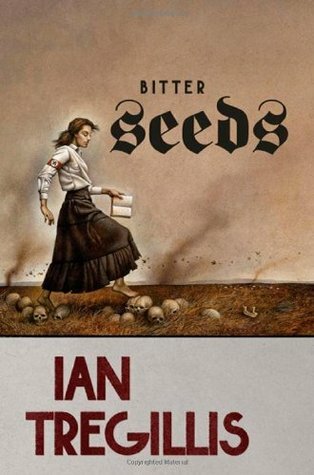 In his book Bitter Seeds, Ian Tregillis combines not only sci-fi, but also horror, with alternative history. Add nazis, arguably one of the best villain groups of all time, to that mix and you’ve got a recipe for a great story. The plot: in Germany, a mad scientist is creating his own band of supermen, soldiers capable of such things as turning invisible, starting fire, and predicting the future. As war looms between Germany and the rest of Europe, the British government forms a group called Milkweed to investigate these reports. 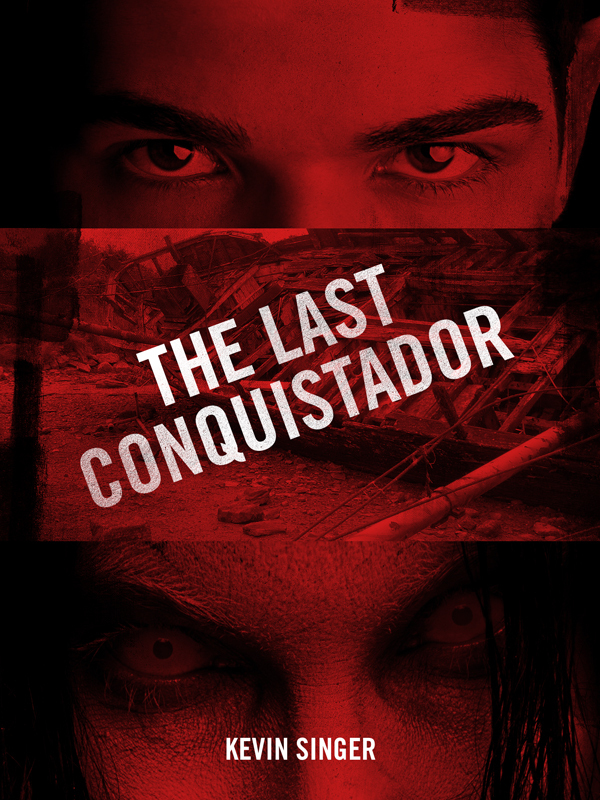 Soon a covert battle ensues as the British group use warlocks to summon dark forces to battle the nazis. It’s actually a complicated plot to explain in a few tight sentences. Our hero is Raybould Marsh, a pugnacious British secret agent who is sent to investigate the reports of these supermen. Soon he summons his college friend Will, a warlock initiated in a blood rite that allows him to communicate with beings called Eidolons. When you think of Eidolons, think Lovecraft. These mysterious beings are not kindly or benevolent. They see humans as no better than ants. They would gladly destroy us but they exist in a different plane, and can never pin us down. Blood helps them get closer. Tregillis doesn’t fully explain what the Eidolons are, but he doesn’t need to. My imagination filled the gaps just fine. Meanwhile, the German team of superheroes is on the verge of falling apart. They were created when they were just children, bought by a scientist who experimented on them (horribly, one would assume, judging from the body count) until he had his team in place. They wear batteries that are hooked to wires embedded in their skulls, which allows them to access their superpowers. This is one of Tregillis’s strengths — he employs, simple, believable technology suited for the era. Think steampunk circa 1930s. 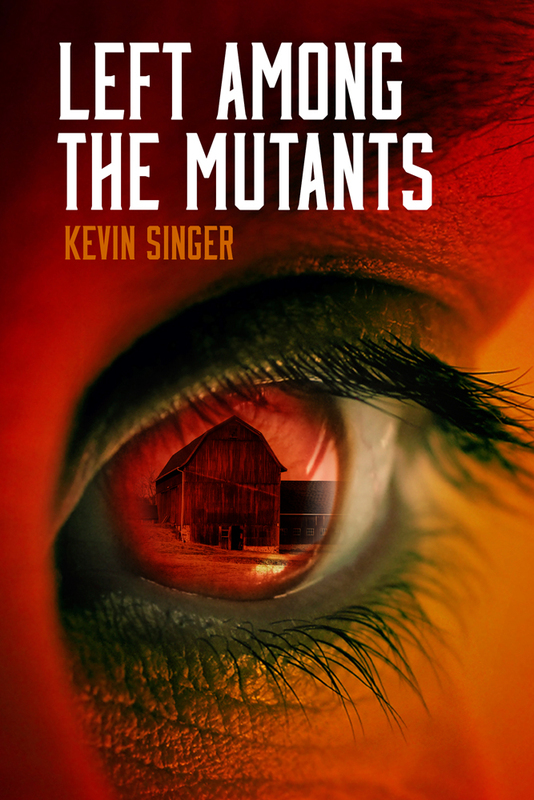 The German story centers on two characters: Klaus, who can dematerialize and move through walls, and his sister Gretel, an enigmatic sociopath who knows the future (though she rarely reveals it). Gretel is perhaps the most compelling character. Why? She is always a mystery, always unpredictable, and always uncontrolled. She’s fascinating to watch. The breakdown. What was good about Bitter Seeds? –The concept was fun. Who doesn’t love watching nazis get beat? –As mentioned above. Gretel was by far my favorite character, though Will, the aristocratic warlock, was a close second. Tregillis convincingly drew a man who grew more and more tortured, especially as the Eidolons demanded higher blood prices as the battle continued. –The Eidolons themselves were a fantastic creation. Thoroughly dangerous, extremely powerful, callously indifferent. I want more. 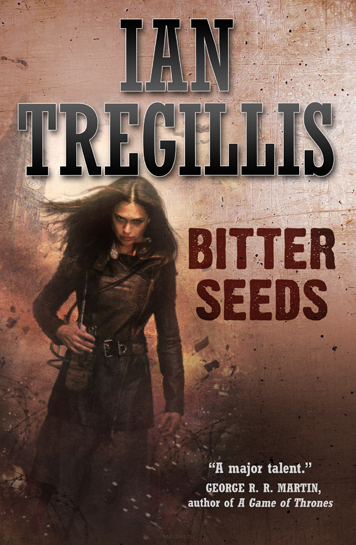 –Tregillis is a skilled writer. As a writer myself, I’m always appreciative of someone who takes great care in the writing of a story. —Bitter Seeds suffers from something I see a lot in fiction. I call it the running in circles plot. Maybe the writer isn’t sure what to do next. Maybe the writer needs to up his page count. But sometimes a story starts running in circles, where the characters are going back and forth (sometimes literally) and not really getting anywhere. Not much plot movement, maybe a little character development. There were several times when I could feel the story lapsing into this. –Aside from Gretel and Will, I cared little about any of the other characters. Our hero, Marsh, was fine, but he never made the leap off the page for me. Similarly, Klaus was very one note. His whole role was to protect his sister Gretel, and that’s all he did. The Germans, especially, were largely forgettable. 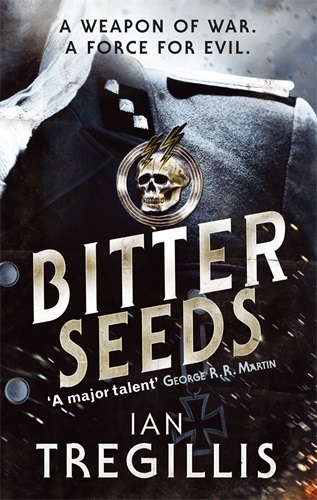 Nevertheless, Bitter Seeds (which is book one in a trilogy) is inventive, imaginative and thrilling. I’m looking forward to discovering where Tregillis will take us next.